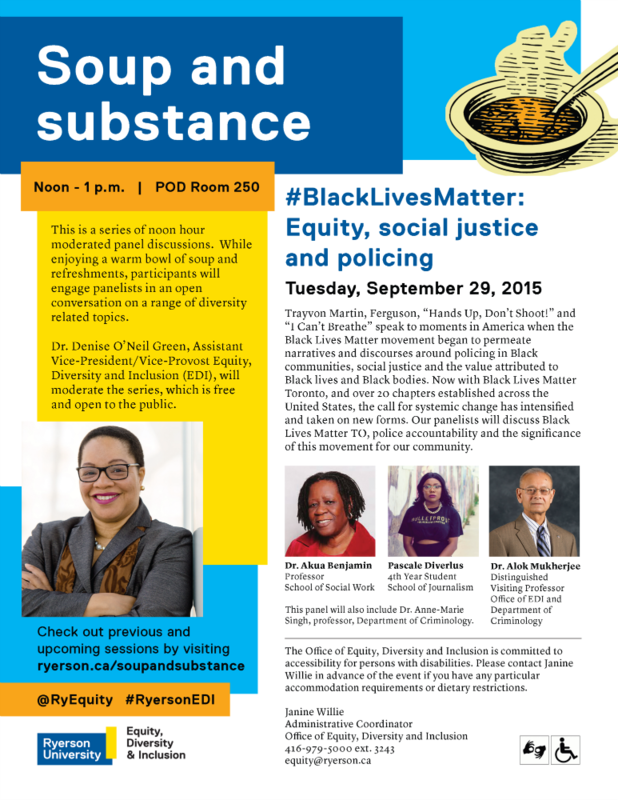 Join us Tuesday, September 29th at noon for the #BlackLivesMatter: Equity, Social Justice and Policing Soup and Substance Series Session at the Podium (POD) Room 250. In this session, panelists will discuss Black Lives Matter TO (Toronto), police accountability, and the significance of this movement for our community. The Ryerson University's Division of Equity, Diversity and Inclusion is committed to accessibility for Persons with Disabilities. Please contact Janine Willie in advance of the event if you have any particular accommodation requirements or dietary restrictions at 416-979-5000 ext. 3243 or equity@ryerson.ca.